I’m always thrilled when the kids take it upon themselves to develop and execute their own creative projects. I’m thinking there must have been and American Indian theme running through our day yesterday, or perhaps my boy’s haircut was inspired by his sister’s Bow and Arrow project. Miss M spent a good bit of time scrounging for just the right bits of vine and sticks for her creation, bending and knotting until she got it just right. I have to say I was mightily impressed at how good her aim got with a bit of practice. 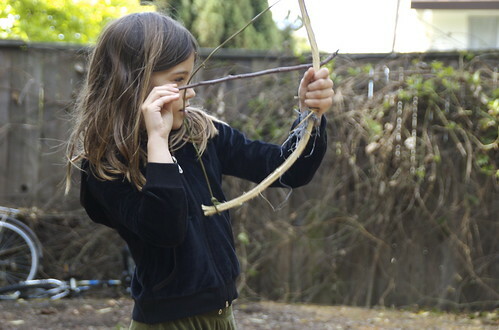 To be able to make bows and arrows and aim well so fast, thats impressive! Hope you guys are doing good. That’s a lovely photo. In fact after a quick look at past posts they are all lovely photos!